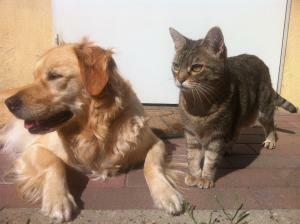 People tend to think of cats and dogs as natural enemies that struggle getting along. Cartoons like Tom and Jerry have gone some way in cementing this idea, but actually cats and dogs can co-habit very happily without too much conflict. It is all about how you introduce them to one another and the quality of the initial interactions. Whether you are thinking about welcoming a new cat or dog into the fold, it is important to remember that the resident pet is top priority, and there is every possibility that they won’t like the new addition, no matter how much ‘acclimatising’ time they are given. Some cats simply don’t gel well with dogs, and vice versa, so the introduction should really be made before you commit to taking on another animal. Forcing two pets to physically confront each other without introducing them gradually can be very dangerous, especially where your dog is concerned. Dogs have a strong prey drive and, even if they’re not aggressive, may see your cat as a plaything to chase around. For the first few days at least, try to keep your dog and cat separated but make it possible for them to still hear and smell each other. Smell is important for communication and your pet can gauge everything it needs to know about the new animal just from smell alone. TIP: A stairgate is invaluable during introductions, as not only will it enable your pets to suss each other out by scent and sound, they can also see each other, which they wouldn’t be able to do through a closed door. If the new pet is confined to a specific room and the resident pet has freedom to roam, rotate this arrangement every so often so your new pet has equal opportunity to explore its new home. When no one is home, it is crucial that both animals are kept apart for their safety. Before your cat and dog are brought together, swap their bedding and toys and anything likely to be covered in their scent, and present them to the other pet. This way they are introduced to the new smells before they come face-to-face with each other. When they do eventually meet, they will be much more accustomed to one another and more likely to get along. Ideally, you want your existing pet to come to associate good things with your new pet. Therefore, any happy interactions they have together you want to reward with something positive. If your cat or dog is staring intently at the other, try to distract it with praise and a treat. Try to repeat this every time your pet becomes fixated on the other so that eventually they stop focusing on it altogether. After a few days to a week of your two pets interacting through a stairgate or crate, attempt a controlled meeting where your dog is securely leashed. If there is any sign of aggression or fear, you have probably proceeded too fast. This includes staring intently, growling, snapping or lunging forward. If the controlled meeting remains calm and both pets seem happy, continue for as long as necessary until both the cat and dog are completely at ease with each other. If after a couple of weeks your pets seem confident and relaxed together, remove the leash and allow them to meet each other freely, being careful to choose a room with plenty of hiding places should your cat feel threatened. TIP: Remember to always praise your pets for positive interactions. If they growl or hiss at each other, separate them, and only bring them back together when they are calmer and ready to get along peacefully. Makes good advice. I will try it when lots of time & brave. Currently working towards introducing a senior cat to a family of 3 equally aged senior siblings! Great article! Cats are good at telling puppies off if they overstep the Mark!